thescribblingtrain – The steaming scribbles of my thoughts and life. The steaming scribbles of my thoughts and life. PGCE English: First Phase Completed. The lead up to Christmas or the second half of phase one was definitely tough. Taking on the year 8 class was really hard because the teacher whose class I was taking over (it wasn’t my mentor’s class) was really intense and I did not enjoy that. She sometimes was very brusque – and I know sometimes teacher’s can be stressed and don’t mean it – but I felt as though she was only like that towards me. She expected me to send her a lesson plan of all the lessons I taught but like instead of telling me her expectations direct to my face she’d get my mentor to say it. My mentor kind of only looked over my lesson plans for the first three/four weeks of my first phase because after that I had gotten the hang of it, so I found having to hand in a lesson plan to B (we’ll call the year 8 teacher ‘B’) just really eughhh. Even when I had sent the lesson plan to her and told her I’ve sent it she’d then be like “I haven’t had time to check it” even though she’d complained that I didn’t send them early enough. I hate stand offish people and she really seemed like that at times. There was on time I was close to tears because of the way she addressed me in an email but, I held it together because I was not going to bawl my eyes out in the staffroom. I’m a very polite and softly spoken person especially if I don’t know you and you’re in a higher authority to me so I found that kind of assertiveness quite aggressive and unnecessary, especially because it was my first phase and I was like new to all the teaching malarkey. Anyway, I liked the rest of the department and they were all really supportive and nice. On to the classes I taught, I fell in love with my year 9 class because I got to know them so well and had “bantaarr” with them. They were a pleasure to teach, even though there were one or two whiners which I had to drag along in their “learning journey” I still enjoyed teaching those lessons. I think it’s also because my mentor let me experiment with my lesson plans rather than B who kind of always loomed over me and made sure they were to the structure she approved of. I will definitely miss 9R2 because of the characters in there, and because they were up for giving all the quirky weird lesson ideas I had a go. Also, even though they were a class that were chatty and sometimes easily distracted I became quite confident in controlling them and managing their behavior. I also enjoyed teaching year 7’s however I only taught them three lessons because my timetable meant I only taught them in week 2 (the school timetable was a week 1/ week 2 system) but they were also lovely. On to a class I had a love/hate relationship with, 8R1. Lessons with this class were literally luck of the draw it didn’t help that all their English lessons were either period 4 or period 5 (last lesson) because they were literally off the walls. They are the weirdest top set I’ve ever come across because most (65%) of them in there are never ready to learn and are constantly disrupting the class. Whilst there were a few in there that were diligent (and really cute) I found the lessons really hard to deliver because of the disruptions and obviously my internal anxiety of B looming over me. I spent many of my break and lunchtime with the “special” members spending quality time and talking about their behavior. I just found that whole scenario draining because the teacher was not supportive and the class were difficult and I was just like ‘Arghh’. It was intense. So, that’s an overview of my first phase as a trainee teacher! Not going to lie, it was intense and it took a lot of perseverance. My skin is taking the toll with lots of under the skin lumps which I assume are stress spots because I didn’t have them before the PGCE ever. I’ve also put on weight I lost and more (sad times) because I haven’t been working out and I’ve been eating junk. Alas, you can’t have it all. For my second phase, I did get the school I requested to my lecturer which I’m really excited about. I’m hoping I’ll love it because everyone on the course was “so in love” with their first phase school and I was just like it’s alright so I’m hoping I’ll be “so in love” with this second phase school especially because I’m going to be there for six months! Anyway, that’s me done! I hope you are all well and I hope to update you soon. I’m typing this in the evening of the third day back after half term and I am already exhausted! The half term was not really a break as up until Wednesday 5pm-ish I was working on my assignment which felt like a dissertation. It was very different to the essays I wrote on my undergrad to say the least! I was away from Wednesday to Friday evening and when I got back I didn’t do 85% of the work I had intended to do. The list of things to do is endless and obviously, lesson planning and marking makes its way to the top and uni admin slips to the bottom again. But, I need to keep on top of the admin otherwise I will fail this year if I can’t keep my evidence to prove I can work at qualified teacher status. I have fully taken on a year 9 set since the week before half term, and until Christmas I will teach them. Next week, I’m going to be acquiring my year 8 class and then in a few weeks I’ll take up my year 7 set; both sets which I’ll also teach till Christmas . The pace at which things are moving at is crazy! At the moment, I’m being observed once a week as a requirement to ensure that the quality of my teaching is progressing but, to be honest, I request more observations just because I want feedback for most of the lessons teach. I’m starting to feel apart of the school as more and more time goes on as the kids don’t give me that look anymore – you know the one ‘you don’t belong to my school’. I also think I’m building a rapport with the kids as I teach more and more through classroom interactions and marking their books. It’s a nice feeling when they say ‘Thanks, Miss’ (note to any trainee: only some (like two) say this). I’ve also become a co-tutor to a tutor group which I don’t know if I feel apart of, but I am helping 75% of them put together their tutor assembly, which they have to present in front of the whole house, so I’m hoping I’ll get to know them better through that. I would love to teach in a school like the one I am in at the moment, even though it’s not perfect, but perhaps not that school. It lacks the cosmopolitan feel to it that I had at the school where I went to and would want to teach at. Hmm, I don’t know. Perhaps, when I move back up north after my PGCE I’ll apply for schools in inner Manchester. To be honest, for the second phase of my PGCE (second phase starts after xmas at a school where I do a six month placement) I have requested an inner city Portsmouth school but my lecturer has said she can’t make any promises. Sometimes, I think my mentor could be better – I mean she’s lovely – but so busy because she teaches a full time table along with being head of English and also mentoring me! There’s another trainee on the English department but she’s training via Schools Direct and when I see her and her mentor bantering and just chatting I feel a bit mehh, whereas my mentor it seems like its 95% formalities and civil/small talk. It’s only till Christmas anyway I can endure it. As for uni, I have made some really good friends. It takes me a while to adjust to people -it also made me feel homesick and miss my old uni- but as more time has gone on I’ve forged some friendships. I’ve been out with them once and I think being out of that uni environment and just chilling – regardless we were talking about teacher stuff- meant that we got to know each other. Anyway, that is it for now! I hope to write soon, if not I will update when I can. So, this blog has been neglected a little but that’s because I’ve started my post graduate certificate in education (PGCE) and pretty much have had no time to myself. The first three weeks of the course consisted 5 days at uni – 8:45AM till 4PM – which drained me – especially, because I was leaving my house at about 7:15AM. Everyday, I came home with so much information in my brain not only because of new knowledge but also the amount of paperwork..the paperwork…the paperwork. So much. One day I came home and fell asleep at 7:00PM and woke up the next morning at 6:15AM. It was crazy because I’m actually can’t usually sleep more than 8 hours. Since starting of the pgce course, I’ve become an everyday on the motorway individual and my driving confidence has improved, even though my parking skills are still atrocious. It takes about 50 minutes to get to the uni and about 35-40 minutes to get to to my placement, but I have to leave my house at 7AM now to get to school for 8AM. Today was my second day at the secondary school and so far my experience has been good. I tracked at key stage three student all day today and observed all the lessons he was in. My mentor seems nice but I think I need to get to know her better; she’s also the head of English so she’s very busy and I just hope she has time for me. Okay, that is me pretty much up to track. Now, I need to go organise my files ect (told you paperwork) and write up a report about what I saw in the lessons today. It’s no secret that I’m obsessed with orange lips which has meant that over the summer I have ended up with a small collection. What I’ve realised is that orange lips don’t always need to be so bold they can sometimes be sheer and simmering. So starting off with KIKO’s ultra glossy lip pencil in 605 which is a moisturising lip liner rather than your typical matte lip liner. The colour of this is the same as the vibrant orange packaging so it really packs a punch. This is perfect for orange lip newbies because you can build it up from a sheer tint (think MAC glaze finish) to the vibrant opacity of a lip gloss. I like to think of it as a lip gloss in solid stick form that doesn’t go gloopy if you over apply it. Obviously lasting power isn’t something that comes with a sheer glossy lip liner but what I love about this lip liner is that if you’re on the go you can literally top up your lip colour by scribbling in your lips and do the universal rubbing lips together action for an even application. Next, in my orange lip wardrobe, I have these two glosses: Maybelline colour semsational cream gloss in Cashmere Rose and NYX butter gloss in Apple Strudel. These two products are sharing a paragraph because not only are they the same formula but they also are pretty much identical in colour, and you don’t really need both. 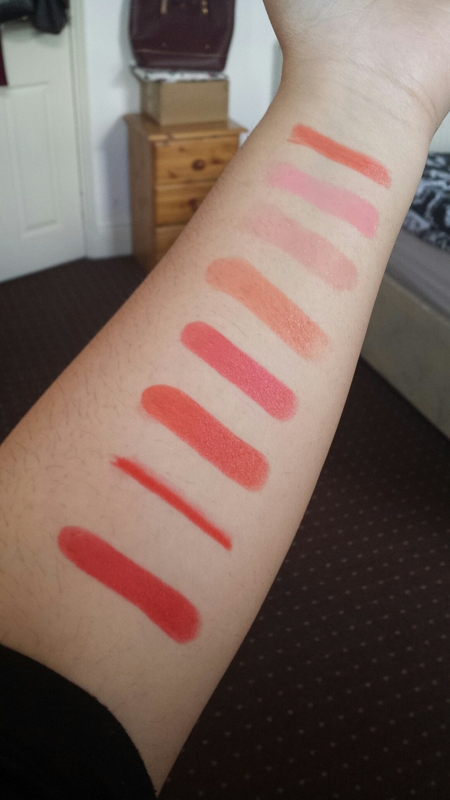 If you were wondering about the orangeness of these I would products, I would say that NYX’s offering is more of a peach whereas Maybelline’s version is a creamsicle shade. Also Apple Strudel is a semi opaque cream gloss which means that it lasts longer out of the two, whereas Cashmere Rose is less pigmented and has some micro shimmer so it probably wouldn’t show up on pigmented lips. Now on to the Revlon Colourburst Lip butter in Tutti Frutti (love the name) which is a notch up in the scale of orange intensity than the lip products I’ve mentioned so far. This fierce orange definitely heats up the lips with it’s tangerine hue. I would say in one swipe of the bullet you are left with a sheer wash however this can easily be built up to a medium intensity pout. This is another moisturising lip product so it is comfortable to wear, however you’ll have to take it with you for top ups. Another lip liner in my arsenal is NYX slim lip pencil in Orange. Now this is definitely true orange and when I want go all out in colour intensity with a matte finish I just fill my lips with this colour. Now, that’s not always for the weak hearted (or those who suffer with dry lips) and you might want to make it slightly more wearable with a dab of gloss. Obviously, you can still use it as lip liner to go under other orange hued lip product to amp up the colour and longevity. Last but definitely not least in longevity or colour intensity are my three orange lipsticks: Revlon’s 750 Kiss Me Coral, Rimmel’s 214 Firecracker, and Topshop’s Rio Rio. These are all amazing lipsticks which I raved about in my ‘Orange lipsticks off the high street’ post, which is an in-depth post just about these three lippies, so I won’t ramble on here. 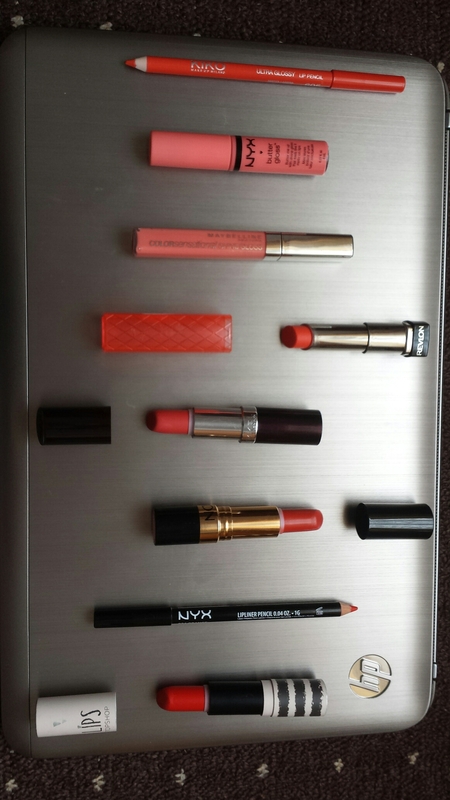 All these lipsticks will definitely make a statement on your lips if that’s what you want. Honourable mention: Tanya Burr’s lip gloss in Let’s Travel The World is a orange-y red lip gloss which would have fitted into this post perfectly but because I’m moving at the moment it’s packed away in a box somewhere. So that concludes my lengthy post on all things orange if you want to see how I wore orange all over my face in a subtle way then click here. Otherwise if you’re just about the statement lip then ease off the blush and add lashings of mascara on to your perfected base. Leave me a comment if you own any orange hued make up products that I could hoard with the rest of my preciousss or tell me about anything (can be completely random) orange that you’ve been loving. SUBSCRIBE TO ME ON BLOGLOVIN or CLICK THE “SUBSCRIBE” BUTTON UP THERE! Wow, I haven’t blogged in a over a month so this post is going to be rusty. Yeah, it’s just me writing over here. Yes, this blog has been neglected but it is still alive. I haven’t really gone anywhere or done anything that I could use as an excuse as to why I haven’t blogged in so long: the only excuse I could give you is that I mentally couldn’t get myself to blog. The first missed post went by, the second followed, with the third hot on it’s tracks, and then the forth, and perhaps even a fifth post would’ve been up if I followed ‘post every 5 days rule’ – you do the maths. So, what did I do in July? Well, it was Ramadan, I went to Southampton for a week, I graduated, and I bought a new car. Apart from that I have pretty much been home everyday doing nothing. I’ve also been suffering from the heat and humidity, but I’ve loved the heavy rain, thunder and lightening that’s accompanied it. I’m not a sun person. I’ve also ordered all the books for my post-grad course but I’m yet to actually ready any. The thought of reading ‘Great Expectations’ by Charles Dickens is definitely trialing my soul. August is my last month at home before I move out for a year, and also my birthday month, which I don’t have much planned for. If anyone is interested I’m turning 21 on the 15th. Another thing, you might have noticed about me if you follow me on Twitter is the fact that because I haven’t been that active in the blogging world I’ve been tweeting about Palestine a lot and the Genocide being carried out there. I’m sure some people who followed me on Twitter for my blog have unfollowed me because tweets about the situation in Palestine isn’t exactly why they followed me. I do still post my thoughts and rambles on there and I probably will start tweeting about blog-related stuff once I get back to posting. But, anyway, because of how I feel towards what is happening in Palestine, I won’t be purchasing from certain brands that fund Israel, which includes beauty products. I’ve looked into it and come to the decision it would be completely unethical to buy from companies that pretty much financially support a massacre of human lives. So, from now on, if you do see any products from said companies on my blog it’s products that I bought before I made this decision. 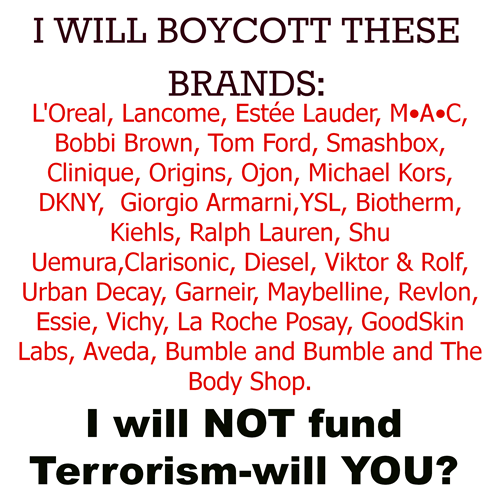 I feel slightly sick now when I look at all the products I have from the brands listed above because I’ve pretty much given money away to companies who fund terrorism. And, yes, I know that they aren’t really going to suffer from me not buying from them, however, least I know in my heart of hearts that I am not accountable for the killing of innocent people. So, that’s pretty much it, I hope August is treating you well, and I’ve got a few ideas for my next couple of posts. If you haven’t already then please subscribe via wordpress (click that button on the right side somewhere) or via bloglovin . Also, if you do want to follow me on twitter I’m @scribblingtrain to see more than just the blogger side to me. Before I get into this, I should probably explain what Depop is; so Depop is a selling app that has become increasingly popular. It is as though Ebay and Instagram had a baby, as you take the picture of your item/s on your phone and upload them directly on to the app. Then, so the item can be found by potential buyers you use hashtags as you would on instagram or twitter, which are basically like keywords for the search bar eg. #MAC #highheels. It also has the safety of Ebay as items are paid through Paypal, however you can pay in other ways, but Depop doesn’t recommend this. So anyway, I put a few items on Depop, and the first two sold really smoothly, and everyone was happy. Then, I sold my third item: MAC ‘Creme Cup’ lipstick for £7. The item was paid for Paypal and I sent off the product, and informed the buyer it was on its way. I sent it with first class on the Wednesday (not tracked or anything), but on Friday I got a private message on Depop from the buyer saying it had not arrived yet. I told her perhaps to wait until Tuesday at the latest because sometimes post can be slow to turn up (even though I had a niggling fear in my belly that it might be lost). So, anyway Tuesday came and it had still not turned up at her house, so I advised her to maybe check if it was at her local depot. The post office informed her that they weren’t in control of the post that comes into the depot, which seems ridiculous because surely they sort it so, that they can effectively deliver them all. So anyway, after that I was like “I’m really sorry it hasn’t turned up, and I don’t really know how I can take this further” which she replied to “Well, can I have my money back?”. Now To be honest, here, in hindsight I should’ve just said “No, sorry, I have a disclaimer up saying I’m not responsible for lost or damaged items, and I don’t give refunds”however, I offered to give her a half-refund out of goodwill, so £3.50, but she said, “Not when I’ve paid £7 for it I won’t”. So I thought, okay I’ll explain to her why I’ve offered her a half refund, and I said that, “I’m offering you half the money back where in most cases you wouldn’t get any back, and I’ve kept up good communication with you in order to try and locate it”. So then, she sent me a message saying how I was responsible for the postage ect, which I replied to her “I don’t really have any control over the postage of the item after I’ve dropped it off at the post office, and in my disclaimer it clearly states I’m not responsible of any lost or damaged post” and I followed that message with “I’m willing to still give you the half refund”. She didn’t reply. So anyway, I thought maybe she’s gone to bed and she’ll reply tomorrow, but she’d only gone and opened a Paypal case against me, which I was like okay, and wrote my statement saying “I do have a disclaimer stating that I don’t give refunds nor am I responsible for lost post, but, in this case, I’m willing to offer a half-refund out of goodwill. But she just escalated it to a “claim” which is where Paypal decide who is right. In all honesty, Paypal doesn’t really give the seller much room to move around, in I was given 3 options, either give her the refund, provide proof of postage, or not respond, in which case she’d win anyway because I didn’t communicate, so I was pretty much forced to give her a refund of £7. I thought Paypal in a claim would freeze the situation so, someone could actually evaluate (not just a computer) the points of the seller and the buyer, but this didn’t happen, as soon, as I gave the refund the case was closed in favour of the seller. I was annoyed and a bit upset to be treated unfairly, and also to have lost out on a valuable product which I know won’t ever be returned to me even though I put my return address on the back. She also decided to leave me a 1 star on my Depop account, but that’s fine because I also left her a 1 star with a long comment ending with “You shouldn’t buy stuff off sellers if you can’t respect and accept their disclaimer”, which I think is completely true because I do not believe I’m the only seller this has happened to. If someone has put in their disclaimer they do not give refunds, and they are not responsible for lost or damaged post, then a buyer shouldn’t be allowed to open a Paypal case against them and win because that’s totally wrong. If you went to a large clothes shop or any shop and the receipt said “no returns” you wouldn’t be able to open a case against them, so why do it against individual sellers. Anyway, I just want to say not everyone on Depop behaves unfairly, the majority are polite and helpful and just want to sell things they aren’t using off to a better home or just looking for bargains. I don’t really know if I’ll sell anything else on Depop because I am slightly traumatized now. Tell me have you bought or sold anything on Depop? Also, what do you think of the situation above? I don’t write about skincare just because even though I have a skin care routine I don’t really dabble in trying new things or splurge on it. However, in mid-April (yes, I know it’s the end of June) something happened to my skin that has never happened before, and that was that I had an allergic reaction, and all my skin flared up. A week previous to that flare up I had started using two new serums – a day one and night one – which to this day I’m still afraid to retry again because I don’t know which one triggered it. Nothing like that has ever happened to my normal to dry skin. At first I thought it was a bit of sunburn on the tops of my cheeks but then it spread across my face. It was red, and then it developed little bumps, and then it became so tight and dry that my face literally hurt to move. To touch it felt rough and anything I put on it made it sting like a b*tch. It literally threw me out of my skincare depth and into a whirlpool of skincare drama. So I had to not only go back to basics but use products that would pretty much resurface the top layer of my skin. 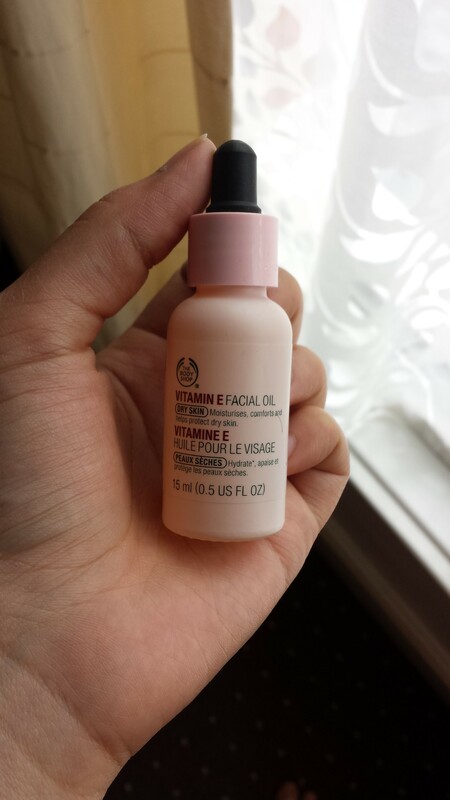 The first product I turned to was The Body Shop “Vitamin E facial oil”. I literally slathered this on my skin multiple times a day because my skin was so dry and it would drink this stuff up so quickly and then dry out again. However, I really believe that the water-retaining qualities in vitamin E oil helped my skin restore itself because as my skin slowly got better I applied this fewer and fewer times through out the day and it was able to keep my skin moisturized. The first few times my skin did sting for a few minutes because it was so dry and tight, but afterwards my skin didn’t have the texture sandpaper. This oil really helped calm down the inflammation and redness, and even though I used it so much, especially at night time before going to bed I’d apply it twice (once half an hour before going to bed, and then just before getting into bed), it would never block my pores or leave my skin greasy. During this flare up I felt that I should only use products with simple ingredients. Cue: Lush Oatifix facemask. This mask is made to moisturise, soothe and help exfoliate dry skin, and it did just that. The first ingredient in this is glycerin which helps attract and lock in moisture, which meant that my skin wasn’t drying out as quickly as I used it more and more. I was using this face mask every other day which I wouldn’t normally do with a face mask but because this face mask helped my skin in two ways it became a necessity; the glycerin in the face mask (along with all the other moisturising products) really helped soften the dead scaly skin sitting on the surface whilst the crushed almond pieces exfoliated them away allowing the new skin to reveal itself and breathe. After I used this product and moisterised with the vitamin E oil I felt like that skin was drinking up the moisture more effectively as all the dead skin had been exfoliated away. The last product that I used on my skin was the 9 to 5 cleanser from Lush. I know this product isn’t particularly targeted at extremely dry skin but I used it anyway and it helped. I would apply a thick layer all over my face and put a hot towel over just to steam my pores a little and soften the scaly skin on days that I didn’t use the face mask. I found it’s lotion-like consistency felt really nice on my rough dry skin and afterwards left it feeling softer. This cleanser is super gentle which made me feel confident it using it over any other products. So these were the products I used pretty much up until the last week of May. I really feel like using only these three products got my skin feeling back to itself again and what I really loved about all three products I’ve mentioned above is that they didn’t break the bank, and I know if I have skin problems again that leave my skin very dry and sensitive I will return back to these products. If you haven’t already then please subscribe, you can subscribe to my blog via WordPress by clicking the subscribe button on your right or via bloglovin.